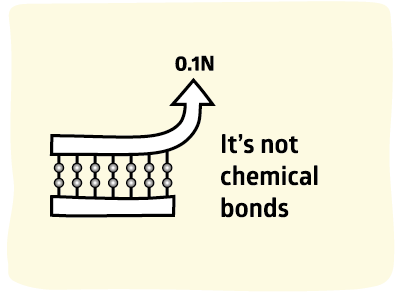 It is taken for granted that chemical bonds provide strong adhesion and that more chemical bonds must be better. "It turns out that the total energy needed to break all the bonds to any one plane or cross-section in most technologically relevant materials is very much the same and does not differ widely from 1J/m2." There are also some "proofs" of the importance of chemical bonds The famous paper of Ahagon1 (the data are those that are used in the WLF page and the "glass" line has been discussed on the Dissipation page) provides a typical example of such a "proof". The line marked with + symbols is one involving no chemical bonds - just the interaction of the rubber with the glass. At low peel speeds the bond is 10J/m2, 50x larger than surface energy, and at high speeds it is >1000J/m2. 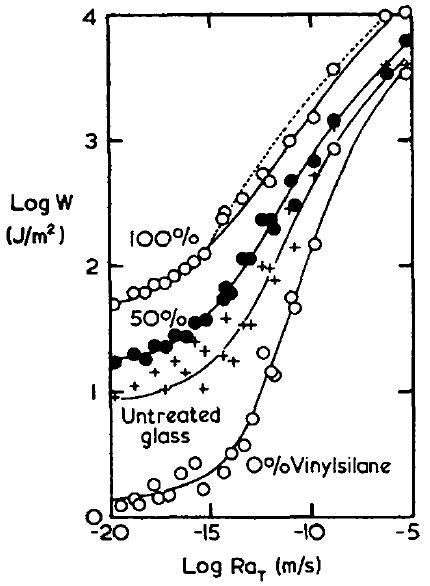 When the glass is pre-treated with ethyl silane (shown as "0% vinyl silane" in the graph) its surface energy is lower and adhesion at low speeds goes down by a factor of 5-10, much more than can be explained by surface energy so this must be a "lack of dissipation" effect for which there is no obvious further explanation. However, at high speeds the effect is only a factor of 2-3. The "chemical" bit is shown in the "100% vinyl silane" line. The glass now contains vinyl groups that can react while the rubber is being polymerised onto the glass. At low speeds this gives a ~5x increase over non-reacted glass, not a very impressive achievement for chemical bonding. At high speeds the effect is a factor of 2 and only a factor of 4 compared to the ethyl silane. All this is in the context of factors of 1000 due to speed. 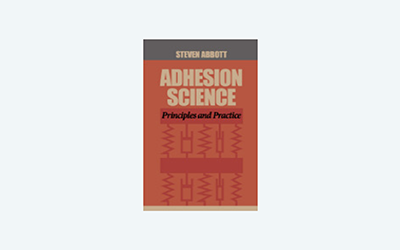 So even in this classic proof of the effectiveness of chemical bonding, the message is "focus all your adhesion efforts on dissipation - anything else is tiny by comparison". The effects of Crosslinks are discussed on their own page.